The much-awaited family running event is on! Unilab Run United 1, slated for March 4, will officially open RunRio Trilogy this year. This will be followed by Run United 2 on June 17 and Run United 3 on September 16. Runners are in for a number of new features and exciting firsts that will make their running experience better, including new race routes, better hydration stations, improved security, more safety marshals, freebies, and more. Five race categories are available: Ceelin 500-meter dash for kids aged 5 to 12 years old, 3km, Dolfenal 5km, Enervon 10km, and Enervon HP 21km. This run’s pre-race giveaway is a race belt or bib holder. Those who will run 21km will not only get a unique collectible finishers medal, they will also enjoy a new race route starting at Bonifacio Global City in BGC and finishing off at Mall of Asia. Shuttle service will be provided from Mall of Asia as pick-up point for 21K runners. Details will be announced. Kids joining the Ceelin 500-meter dash will also get their own singlet. Registration for Run United 1 is ongoing at the following stores like Riovana at Bonifacio Global City and Katipunan, Quezon City, Toby’s at SM Mall of Asia, Pasay City and The Athlete’s Foot at Robinson’s Galleria, Ortigas. For online registration, check details at www.runrio.com. Registration is until February 26. 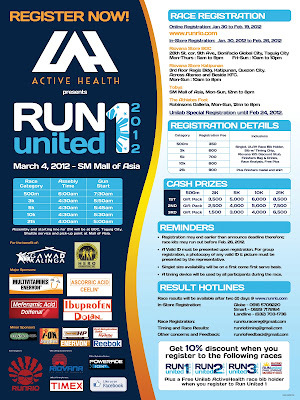 Run United is for the benefit of Gawad Kalusugan (the health program of Gawad Kalinga) and Hero Foundation. It is part of Unilab’s advocacy through Unilab Active Health to promote an active lifestyle among Filipino families. For more inquiries, check out www.unilabactivehealth.com and ww.facebook.com/unilabactivehealth. 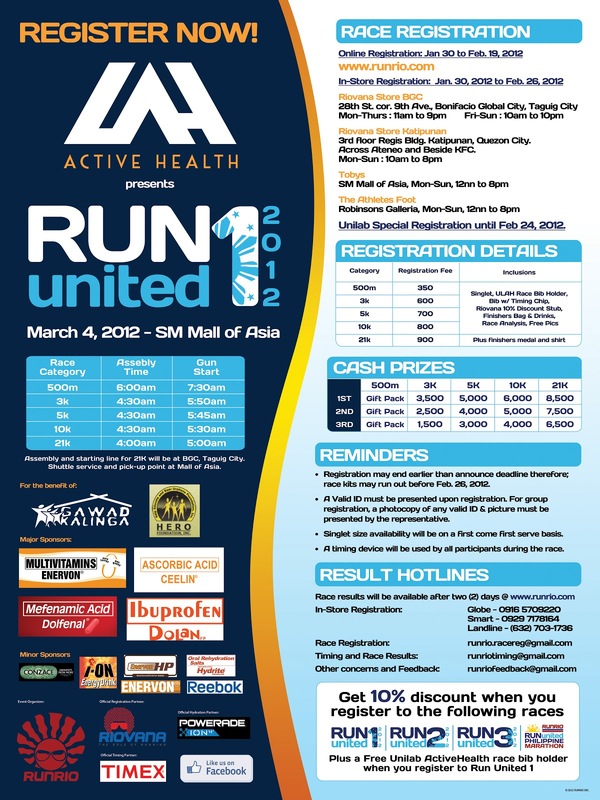 Labels: gawad kalinga, run rio trilogy, run united 2012, run united registration.